The Northern Woods are the northwestern region of Reaper's March. It contains the city of Arenthia in the north, as well as Fort Grimwatch and Greenhill further south. The Northern Woods Dolmen is just south and a bit west of Arenthia, along the river. It is bordered on the west by Malabal Tor. 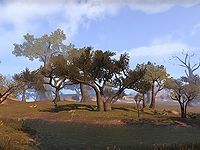 Dawnmead lies to the east and Jodewood is to the south. Down the Skeever Hole: Defeat the last of the Colovian invaders. 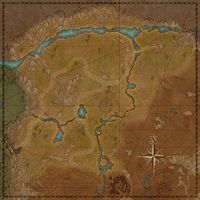 Gates of Fire: Help defend an Ayleid ruin from the Colovians. Gentle Gardener: Collect gardening samples from Falinesti Autumn Site. Oath of Excision: Help the Vinedusk Rangers repel the Colovian invaders. Over the Edge: Help retrieve some critical medical supplies. ​ Restore Arenthia 5 Restore Arenthia to control by her Clanmother.